In my opinion, one of the most important posts on content marketing this year was Joe Pulizzi and Robert Rose’s, Build a Successful Content Marketing Strategy in 7 Steps. 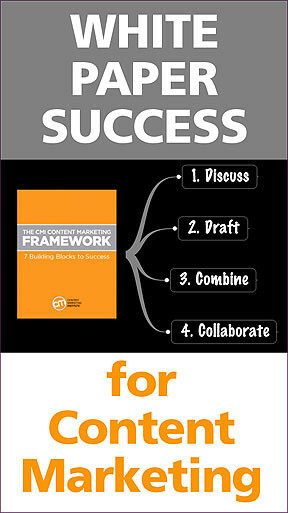 The post remains significant, not only because of its content (which includes a concise summary of the Content Marketing Institute’s philosophy), but also because it introduces the white paper they coauthored: The CMI Content Marketing Framework: 7 Building Blocks to Success. This Framework is an example of white paper marketing at its very best. Just 10 pages long, it concisely communicates the principles that drive CMI. It also reflects a perfect partnership between text and graphics. Unlike a lot of white papers, it’s also an “evergreen” white paper — one that will remain a relevant and compelling content marketing vehicle for a long time. Naturally, I was interested in learning the “inside story” on the origins of the Framework white paper, and how it came together. Accordingly, I contacted Joe and Robert, and asked them if I could interview them about this compelling content marketing effort. They immediately agreed. One of the most important takeaways from my interview with Joe and Robert was the way the Framework white paper originated through a discussion rather than writing. If you have been trying to write white papers by yourself, or have been delegating them to a single content creator, you might want to look for ways you can add additional perspectives and dialogue from the earliest stages of white paper development. Having agreed on the goals of the white paper, they met face-to-face. In Robert’s words, “Joe and I sat down at a table and talked; we white boarded out the steps — the nodes in the framework, if you will.” When they finished, they had a working plan for the white paper. The second major takeaway from the discussion occurred when I asked, whether they had a publication date in mind from the start, or if they just said they would publish it when it was ready. Robert affirmed that they started with a target end date and worked toward the deadline — a process he estimates to have taken about eight weeks, total. At this point, they were well into the revision phase of the white paper, and were ready to move on to the design and graphics stage. Words, of course, are just part of the story of any white paper. As is often the case with any compelling content effort, white papers benefit from the inclusion of graphical elements that bring the information and ideas to life. With this in mind, our discussion segued to the Framework graphic that appears on Page 2 of the white paper. There are several lessons content marketers can learn from the way the CMI team developed this Framework graphic — all of which are particularly important if you have delegated graphic design and layout to an outside freelancer and discover you may have left too much up to them. In other words, although not graphic designers themselves, the authors spent a lot of time identifying what they were looking for before any work on the graphic commenced. The second lesson here relates back to the project’s eight-week schedule, which allowed sufficient time for the graphic to be fine-tuned. “[The graphic] was the [one component of the paper] that went through the most iterations,” Robert admitted. Participatory oversight and iteration are essential to creating meaningful visual content — as opposed to using graphics simply for the purpose of decoration. Robert and Joe’s direction ensured that the graphics would be message-based, rather than subjectively designed. And developing a timeline that provided adequate time for revision ensured that the final graphics would be polished and refined, rather than compromised by last-minute production constraints. One of the themes that occurred throughout the interview was Robert and Joe’s continuing emphasis on collaboration. Coauthor collaboration: Joe Pulizzi and Robert Rose did not write in a vacuum. They talked, they traveled, and they taught together, and these experiences helped drive their initial white paper planning sessions, which also involved sitting at a table together and working on a white board. After writing their individual drafts of the white paper, they shared their versions, and developed a composite that incorporated the best elements of each version. White paper and website integration: Again, this white paper was not created in a vacuum: All of Joe and Robert’s content creation, design, and development plans took CMI’s overarching content marketing strategy into consideration. Later in the interview, I mentioned how much I liked the way that each of the seven steps in the Framework had its own structure (i.e., the introduction; the list; the closure, etc.). Again, this decision was the result of collaboration: The elements of text architecture used for the final white paper didn’t actually originate with the coauthors. Editorial calendars: Does your firm have an editorial calendar that leaves enough time for creating white papers without interfering with other projects and responsibilities? Writing processes: Do you stress the importance of planning before you write? Regardless of who writes your white papers, do you encourage them to start with a mind map or outline based on your market’s personas, the message you want to communicate, and the way you’re going to use the white paper? In particular, do you encourage your firm’s top voices to partner on projects, with each one creating his or her own drafts, then rewriting and building upon each other’s ideas, until a richer viewpoint emerges — one that goes beyond what either alone could accomplish? Collaboration: Most important, does your business or association — regardless of size — have a dependable team of writers and designers to create your white papers, plus established communication procedures to engage everyone involved in your content marketing success? Please share your comments, questions, and your firm’s best practices for white paper creation below. Looking for more ways to maximize the impact of your e-book and white paper content? Get practical insights, advice, and answers in our 2018 Guide to Essential Content Marketing Tactics. A lifelong content marketer, copywriter, and author, Roger enjoys helping clients write books and simplify their content marketing. Follow @RogercParker on LinkedIn at ContentMarketingHelp. Download a free copy of his 4-page 8 Commitments of Content Marketing Success.